With the ambition of becoming one of the hottest destinations in Europe in the field of adventure, on August 1, 2016, Wales officially opened the world’s largest artificial surfing lake. It was one of those ambitions that Wales tourism industry decided to move to next to the free-winding cable system, jump a spring on the cave … After more than two years of construction on an old aluminum foundry, Snowdonia surfing park is located in the town of Dolgarrog, located between the Conwy valley at the foot of the Snowdonia Mountains, northern Wales. They started picking up the first guests .. 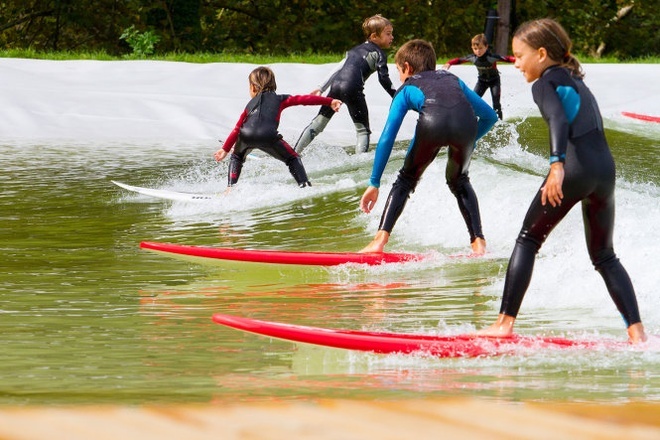 This is the first artificial surfing center in the world by Spanish company Wavegarden. Previously, in 2011, this model was introduced in Spain for commercial testing and demonstration purposes. Different from the structure of a wave lake, Wavegarden is an outdoor lagoon and the whole device is submerged. As a result, the artificial surfing lake can blend in with the natural landscape in Snowdonia National Park, where there are many beautiful rivers and lakes and forests. Wavegarden surfing lake is 300 m long, 113 m wide, has the longest artificial waves in the world with an altitude of 1.2 to 2 m and 150 m long. The wave at the end of the lake is smaller for beginners to learn to surf. Ho can pick up dozens of players to surf at the same time. Entrance fee for Snowdonia surfing area changes with season and surfing level. In addition to the surf lake, Snowdonia Park has many wild hills and 15 mountain peaks higher than 914 m, making it a true paradise for mountain climbing, mountain bike riding and hiking. According to the local government, this tourism service is an opportunity for Dolgarrog to close the dark days, when after nearly a century of operation, the mines closed massively in 2007, causing unemployed miners. rampant and young people in the region lose their orientation and identity. Mandy Williams-Davie, a local official, said that now, teenagers in Dolgarrog were able to boast of their place of origin and have a story to tell people.